Stop Snoring and Get a Better Night’s Sleep! Do you snore throughout the night? Don’t feel rested in the morning? Are you dealing with chronic headaches? Do you have trouble staying alert while driving? Do you take frequent naps during the day? Sleep apnea is a common medical condition where a person stops breathing for dozens of times every night, often without even knowing it. This can do more than affect sleep and quality of life. Left untreated, sleep apnea can lead to life-threatening complications. Don’t let these symptoms go ignored and untreated. Towson Smile Care is here to help. Our sleep apnea dentists use effective, non-surgical treatments and friendly care to help you sleep and feel better fast. When you visit our Towson, MD dentist office, we’ll discuss your symptoms and risk factors, exploring diagnostic options to determine the severity of your sleep apnea. From there, we’ll outline the best treatment to fit your needs. In moderate to mild cases of sleep apnea, we may recommend a custom-fit oral appliance. This oral appliance resembles a sports mouthguard and is designed to move your tongue away from the back of your throat. This treatment helps reduce the number of apneic events during the night and reduces your snoring. We often recommend tying an oral device if CPAP is not the answer for you. Oral devices are less complicated, more portable and have higher compliance rates than positive air pressure breathing device. A CPAP (Continuous Positive Airway Pressure) machine is the gold standard of treatment for more severe cases of sleep apnea. It’s also an excellent alternative to invasive surgery to remove excess tissue from the throat. 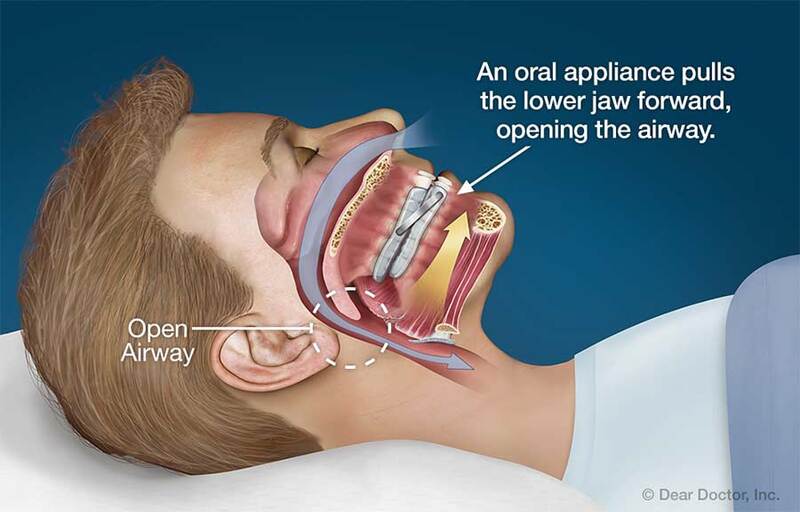 The CPAP is worn at night and gently repositions your lower jaw, opening your airway and preventing obstruction. Today’s CPAP machines are much more comfortable and user-friendly than in years past. At Towson Smile Care, we take a personalized approach to dentistry and your sleep apnea treatment. Your needs always come first, and we understand that living with the symptoms of sleep apnea can cause pain and stress. Using the latest, most advanced treatments and techniques, our goal is to improve your dental health and help you sleep normally again! Don’t wait to get the care and relief you deserve. Give us a call today at (410) 296-7599 to schedule your consultation. Since 2009, the Towson Smile Care team has been dedicated to providing the highest quality dental care and patient experience in Towson. Over the years, we’ve earned the reputation for providing a welcoming, judgment-free office, experienced staff, and high-tech treatments. Do you suffer from dental anxiety? Let us know! We’ll ensure you feel completely comfortable and at-ease during your appointment. Worried about paying for your treatment or have questions about your insurance? Our team is happy to explain treatment costs, outline benefit coverage, and file insurance paperwork on your behalf. No dental insurance? No problem! If you don’t have dental insurance, ask us about our payment and financing options. Are you ready to sleep better and treat your sleep apnea?